I'm sure you know by now I am a massive skincare fan, and I am always on the lookout for new treatments and products, I am not getting any younger and wanna keep my skin looking as youthful as possible for as long as possible. 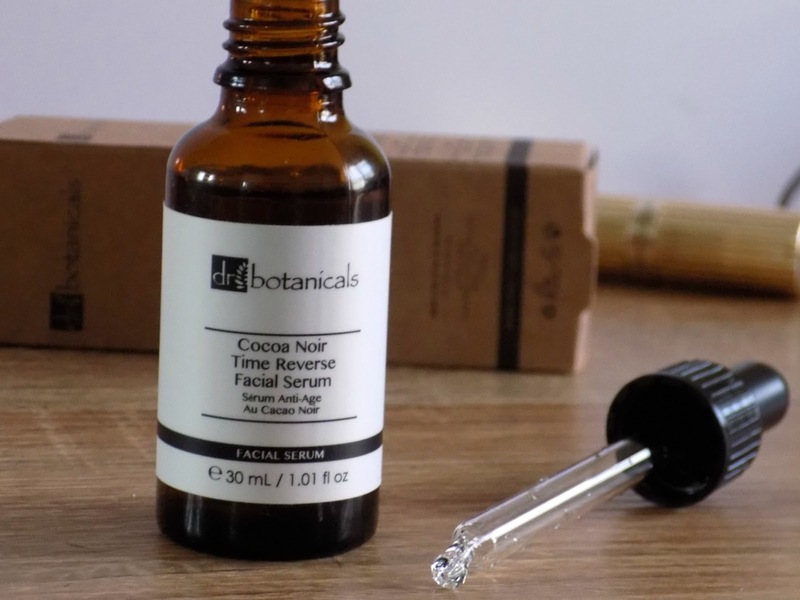 That's where this Cocoa Noir time reverse serum* comes in, I have tried a few things now from Dr Botanicals and I have been impressed with everything I have tried and this serum is no exception. What I love about the brand is they use 100% natural ingredients, and are vegan and cruelty free. The packaging is simple and stylish and the products are just so enjoyable to use and feel like you're really doing your skin some good. The key ingredients, Geranium flower oil helps to even skin tone and firm and plump the skin, Seabuckthorn fruit oil promotes hydration, Neroli oil, improves skin health, reduces uneven skin tone and visible blemishes. Since using the cocoa noir serum I have noticed how much smoother my skin looks and feels and my complexion definitely just looks brighter. I have added this in as an extra step in my skin care routine after cleansing and before moisterising, and I can honestly say I am loving the results.
" Who should use Coco Noir Time Reverse Facial Serum? Use this product if you are concerned about fine lines and wrinkles Use this product for skin tightening Use this product for firmer skin You can use all Doctor Botanicals products with your existing skincare regime "
Cocoa Noir time reverse serum* not only looks stylish in my bathroom, it smells amazing and I really love how my skin looks since using it, plus it makes my skin so smooth perfect for the application of makeup. If you want to try it out for yourself you can use my discount code KATE1, in the month of May, and get this little bottle of goodness for only £19,99.